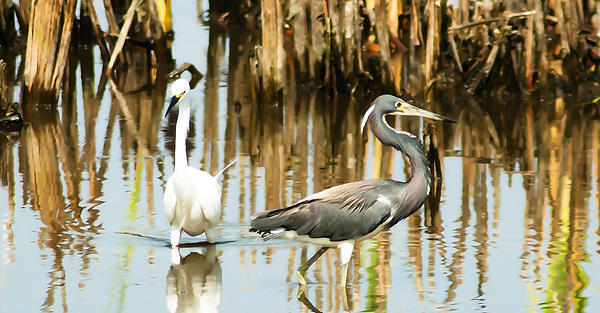 The�snowy egret�is an inhabitant of shallow freshwater and saltwater wetlands from the upper United States down through Mexico, Central America, the Caribbean, and South Amerca to Chile and Argentina. Not found in the mountains. 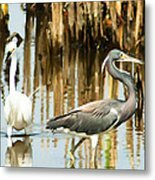 It is more common along the coasts on mud flats and beaches, preferring brackish or marine habitats over freshwater,�but is found inland in shallow marshes, ponds, and wet agricultural fields. 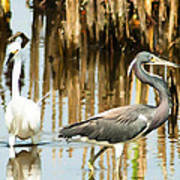 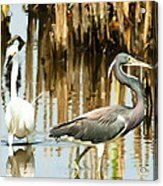 Snowy egret and tri-colored heron search a diminishing pond for breakfast in Ruskin, Florida.